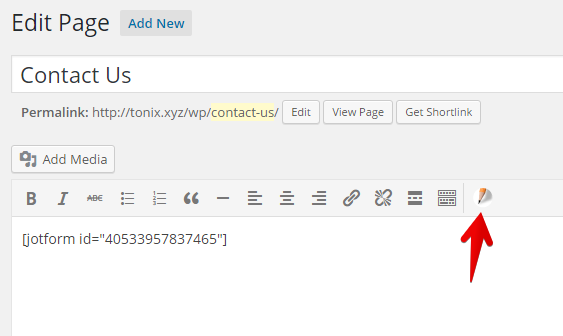 Here's how to embed Jotform in Wordpress using the Embed Form Plugin. 4. Whenever you edit or add a post or page, you'll see a Jotform pencil icon in the formatting toolbar, clicking it will open the form picker where you can select your forms from Jotform. If you have any questions, please post it below. I want to use Jotform on a word press website, ( we use the Bakery Builder) but when I search the plugins it suggests the jotform plug in has not been updated in 3 years and may not be compatible. 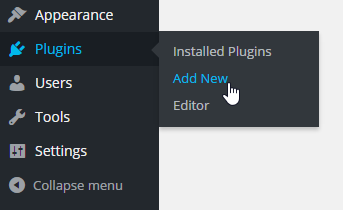 How do I get the latest version of the plugin? Bit of a joke that your plugin hasn't been updated for 2 years! Really? Considering the integrations on offer and that 60% of all CMS systems online are Wordpress, it's pretty poor form that you haven't even replied to the issues below. Is there a time frame on the fix? Tried it but when I clink the pencil, it is just a blank screen. I have the same issue. When i click on the pencil icon it shows a grey square with the text "File not found". By the way the plugin used to work on my Wordpress website a few months ago. Not anymore. Tried to uninstall and install the plugin and deactivate all the other plugins related to the embeded forms. Hey, my forms are not coming up when I click the pencil icon just says file not found HELP! Actually I wish to have the form in the menu point "contact us"
All other forms also from jot form ar ok, only this one contact us form does not work. I have a theme installed, as well as a builder, which makes it so I don't edit my pages via the usual visual/text area of the desired page. Is there a way to use this with themes/builders, without having to add a child theme? Can I get a simple html embed code and add it to one of the body blocks on the page? Thanks. I cannot use a plug-in at this point for various reasons. Is there an issue with the embedded version? Please where can i find the power tool option to paste my iframe code? My version of wordpress, the latest, is 4.8.3 and your jotform embed form only supports 4.6.8 and does not work correctly with latest wordpress version. Can you fix this. Thank You. We're looking at using the JotForm plugin on our WordPress site. I understand a user can part-complete a form and then 'sign-in' later to complete it? Is that the case? Plus - when a form is completed and supporting documents are attached, where does the form data reside and how is it accessed? FYI this plugin hasn't been updated in 10 months and is untested with the latest version of WP. Don't know if this is an issue or not but thought I'd bring to the attention of people who see this. I can't see my pencil on the page editor. Although I deactivated gravity forms and contact form 7. 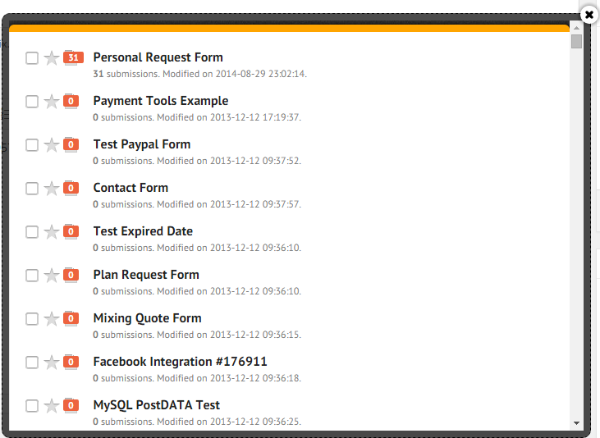 I have tried to embed the form in all different ways, through the code, the platform embed, and the plugin. Nothing works.. it just shows blank when i do the preview. Hello I am getting to the point where I select the form in the page in Wordpress.org and it will not let me select the Form when I press the Select form button on the bottom right of the page nothing happens ? Nao consigo seleciona o form para meu wordexpresss, clico em select form e nao faz nada o botao nao executação nenhum. It works if i use the normal wordpress like in the video but the shortcode doesnt work if I try to add it to a text while using beaver builder. Any ideas ? This STILL doesn't work. Jotform is a major fail when it comes to providing proper forms for Word Press! I'm using the Page Builder plugin and cannot get the JotForm Embed to work with it. Any thoughts.. I wanted to add my JotForm to a 3 column row on the right 3rd. Any thoughts? I keep getting this message when trying to activate the form. Form Generator is not Active. Login or sign-up with Jotform to get started. connect with jotform button doesn't work at all. I just used this plugin for my form. My form takes up my WHOLE screen, overtop of my webpage. I am using the generic TwentyTen theme for Wordpress. What is causing this problem? I was under the impression that anything uploaded to Jotform would not fill up the server space on Jotform. Is this an incorrect assumption? My client (printer) needs an inexpensive way to have their customers upload files. Your $9 per month is too much for them. Thank you!